Condition: Intact. Occupied as a residence. Ownership / Access: Forbes Family. 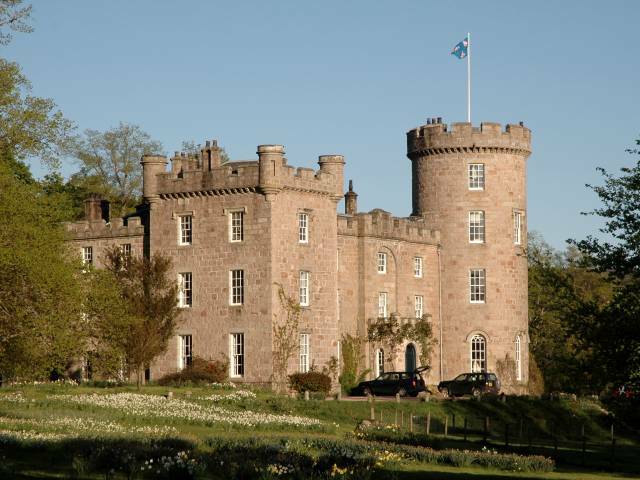 Notes: Castle Forbes is a 19th-century Scots Baronial country house near Alford in Aberdeenshire, Scotland. The 6,000 acres (2,400 ha) Vale of Alford estate has been home to the Forbes' for over 600 years. The original house was named Putachie. The present castle overlooking the River Don was built in 1815 by the 17th Lord Forbes, to designs by the architect Archibald Simpson. However, after Simpson encountered structural problems and the original section of the house (from c. 1731) began to crack, Simpson was dismissed and the work was completed by the City Architect of Aberdeen, John Smith. Today it is occupied by Malcolm Forbes, 23rd Lord Forbes (his father the 22nd Lord Forbes died 5 March 2013), and his wife Jinny and open to residential guests. The estate offers fishing and golf. In 1996, a former dairy building was converted into a small perfumery. The castle is a category B listed building. There is a stone circle dating to 3000 BC on the estate.